Yplatform | global insights – local impact | Connect. Empower. Inspire. Joining our journey to share the aspiration? 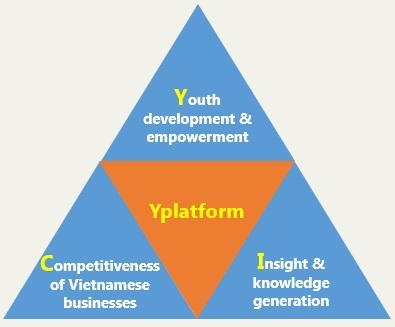 The vision of Yplatform is to create the connecting platform among global talented youth and businesses/organizations in the joint effort to strengthen Vietnam's global competitiveness in different aspects. To generate Insights and knowledge about Vietnamese businesses through facilitating the establishment of industry knowledge and business case resources tailored to Vietnamese business conditions. For the international academic community: Vietnamese businesses still remain a mystery, and there is insufficient information about Vietnamese business conditions. These are the gaps that Yplatform envisioned to fulfill and lay the first brick of a model that could possibly contribute something tangible to the development of Vietnam. We hope to create a conducive platform where like-minded individuals and stakeholders (regardless of locations, nationalities, or backgrounds) can network, share, and work together in the joint effort to strengthen Vietnam's global competitiveness. Our organizing team consists of high-caliber students and young professionals who wish to contribute their talents and international experience to the sustainable development of Vietnam. Our organizers are studying at/have graduated from top universities worldwide and/or have working experience in top multi-national companies in Vietnam and overseas. We have team members located in Hanoi (Vietnam), HCMC (Vietnam), Singapore, and soon in other countries such as the United States, Europe, etc. We have received the supports from our Board of Advisors, together with the Network of Academicians and Network of Business Leaders, in addition to the official partnerships with NUS Business School (National University of Singapore), SMU Case Writing Initiative (Singapore Management University), Institute of Potential Leaders (IPL), and various leading corporations in Vietnam. Our past programmes such as Ysummit 2010 (a conference where Vietnamese youth in Singapore gathered to share passions and be inspired by the forerunners from diverse backgrounds in the discussion about various opportunities to contribute to Vietnam’s development), Ychallenge 2011 and 2012 (a youth-led international business case competition on Vietnam’s leading businesses, with a purpose to create a model platform fostering the exchange of ideas and experience between businesses in Vietnam and young talents with international insights), etc. have attracted more than 2,000 participants of different nationalities who are studying at/have graduated from more than 60 universities in Singapore, Vietnam, and other countries (see the full list of our programmes). Our conferences & talks have created various networking opportunities for the participants and partners. Concurrently, we have also produced Case Studies about Vietnamese companies. We have been covered by a number of leading newspapers in Vietnam, and have received positive feedbacks from our partner companies as well as other experts. In 2013, we launched Yplatform Solutions which is both a consulting program for SMEs in Vietnam as well as a training program for Vietnamese students to become Student Consultants (see examples about the training modules as well as our recruitment). We hereby invite you to join our journey! At Yplatform, it is NOT so much about YOU joining US. It's more that WE exchange our dreams, trying to find some common grounds, doing something together, and learning and improving everyday. Let us share our passion together! That's our spirit and we look forward to talking to you soon! Yplatform is bringing global insights to create local impacts. We invite you to join our journey!